Penile cancer is a disease with a high morbidity and mortality. Its prevalence is relatively rare, but the highest in some developing countries. Insight into its precursor lesions, pathogenesis and risk factors offers options to prevent this potentially mutilating disease. This review presents an overview of the different histologically and clinically identified precursor lesions of penile cancer and discusses the molecular pathogenesis, including the role of HPV in penile cancer development. 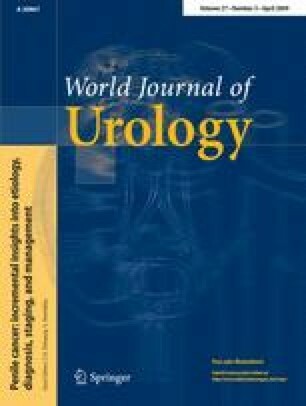 A systematic review of the literature evaluating penile carcinogenesis, risk factors and molecular mechanisms involved. Careful monitoring of men with lichen sclerosis, genital Bowen’s disease, erythroplasia of Queyrat and bowenoid papulosis seems useful, thereby offering early recognition of penile cancer and, subsequently, conservative therapeutic options. Special attention is given to flat penile lesions, which contain high numbers of HPV. Their role in HPV transmission to sexual partners is highlighted, but their potential to transform as a precursor lesion into penile cancer has been unsatisfactorily explored. Further research should not only focus on HPV mediated pathogenic pathways but also on the non-HPV related molecular and genetic factors that play a role in penile cancer development. Options for prevention of penile cancer include (neonatal) circumcision, limitation of penile HPV infections (either by prophylactic vaccination or condom use), prevention of phimosis, treatment of chronic inflammatory conditions, limiting PUVA treatment, smoking cessation and hygienic measures. M.C.G Bleeker and D.A.M Heideman have contributed equally to this paper. We acknowledge professor Dr. Th.M. Starink for providing the clinical picture of bowenoid papulosis.